It is absolutely free. No adware, no spyware, no toolbars. Works with most common RAID types (RAID 0, RAID 5, RAID 10). Got awards, recommendations, and reviews from trusted sources. 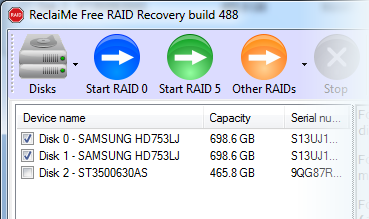 ReclaiMe Free RAID Recovery doesn't work with a single hard drive. RAID is a multiple-disk unit (see explanation), so if you have a single drive, you need ReclaiMe File Recovery. Note that ReclaiMe Free RAID Recovery does not give you the ability to do file-by-file recovery. RAID Recovery only works with arrays in their entirety. use regular data recovery program if only some files are needed.